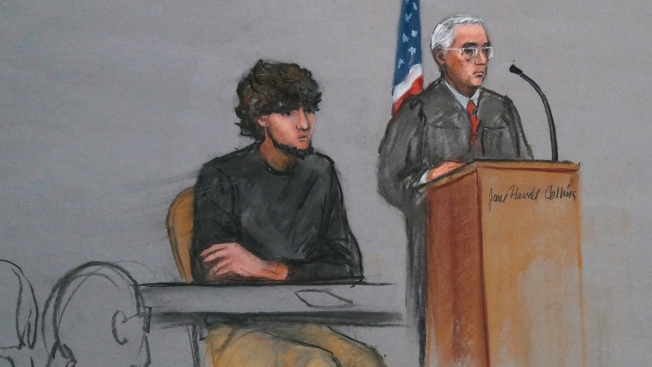 FILE - In this Jan. 5, 2015, file courtroom sketch, Dzhokhar Tsarnaev, left, is depicted beside U.S. District Judge George O'Toole Jr., right, as O'Toole addresses a pool of potential jurors in a jury assembly room at the federal courthouse, in Boston. The second phase of the trial of Boston Marathon bomber Dzhokhar Tsarnaev will begin on April 21, after the second anniversary of the attack and the day after this year's race. U.S. District Judge George O'Toole Jr. granted a request Friday from Tsarnaev's lawyers to give the defense additional time to resolve logistical issues with potential witnesses. Tsarnaev, 21, was convicted by a federal jury Wednesday in the 2013 attack, which killed three people and injured more than 260. The jury convicted him on all 30 counts, including 17 that make him eligible for the death penalty. During the second stage - known as the penalty phase - the same jury will hear additional evidence and be asked to decide whether he receives the death penalty or is sentenced to life in prison. The delay means the trial won't be held on two sensitive dates: April 15, the second anniversary of the attack; and April 20, this year's marathon. O'Toole said in his written order that it is not uncommon to have a recess between phases in capital cases. During the first phase of the trial, Tsarnaev's lawyer bluntly admitted that he participated in the bombings but said his older brother, Tamerlan, was the mastermind who enlisted his then-19-year-old brother to help him. Prosecutors said Tsarnaev was an equal partner in the plan with Tamerlan. Each brother planted one of the two pressure-cooker bombs used in the attack near the finish line of the marathon. Tamerlan Tsarnaev, 26, was killed four days after the bombings when he was shot during a gunbattle with police and run over by his brother during a chaotic getaway attempt.